This serviced office centre is located in a well-known complex, conveniently close to many excellent transport connections. The area is home to a large number of major local and international business. The airport is just a 5-minute drive away. 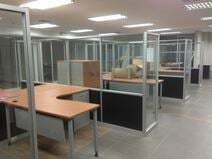 Ideal for international companies looking for temporary or permanent workspace solution packages in one of the most innovative and commercially renowned corporate districts in all of Ecuador, this modern mixed commercial office building provides an extensive variety of spacious, flexible serviced, co-working and workshop options close to the city"s growing industrial sector. The locality also provides excellent transport links, connecting commuters to the wider region and beyond.